Here’s that new phone that Pappa gave me! Now I can talk on the phone just like grown-ups do!! Now, how do I dial? How are you? Guess what happened to me today!! Uh huh, and then ..
My house-helper told me what she watched on the news last night. A thirteen year-old child slave in Dhaka was beaten mercilessly by her owners, and by the owners’ own children. They pulled her nails off. They tried to strangle her. She was beaten so much that her body was covered with bruises. She left the building with the excuse of emptying the trash and then she ran to the slum and hid. People there called the police and took the girl to the hospital. The police asked her owner what happened and he said that the girl had fallen down the stairs and had fallen while trying to clean a ceiling fan. In Bangladesh, between the years of 2000-2004, 9 of these child slaves went missing, 97 were tortured, 139 were killed, and 40 raped. And these are the the registered cases — so in a country where the justice system is fraught with corruption, I can promise that there are many other such incidents, though unrecorded. Ruma is one of them. She works for the family in the above apartment. Her family is dirt poor, so they gave her to this rich family, with the understanding that they will pay the dowry when Ruma gets married. Ruma has been working for them for years now, and I think she is about 11 or 12 now. Ruma does get to see her family about three times a year. And she does get some time off work to play on the roof or come visit me. But she does not receive the same food as the family. She is constantly scolded for little things. One time a sock went missing and her owner said that she would kill Ruma if the sock was not found. Ruma was crying with fear. A few hours later, another neighbor returned the sock!! There have been occasions when we can hear Ruma being beaten. One time, when the noise of crying lasted for hours, I went upstairs to talk to them. They complained of Ruma’s disobedience, and I told them that she is too little to work so hard — she is just the age of my littlest sister. There have been other times when she is beaten in front of us. It is hard to know what to do. I am teaching Ruma how to read whenever I get the chance and I give her a glass of milk now and then. I stand up for her whenever she is scolded in front of me. But it seems so little. If only there was a way of complaining to some social worker or filing an anonymous case or something. Here is Elias helping Amina bake bread. He loves lids and containers. A little engineer when he grows up?? Colorful salads. Sometimes its a good thing that you can’t get lettuce here — you got to branch out and try some other greens! Jacob’s Swedish cousins didn’t know how to use a pressure cooker. My Mom ALWAYS used them, so it’s rather second -nature to me. But hearing that they didn’t know how to use one made me realize that maybe my experience is the exception. Anyway, here is a pressure cooker. And with care, it can make beans or lentils or rice or soup SO much faster than normal pots. 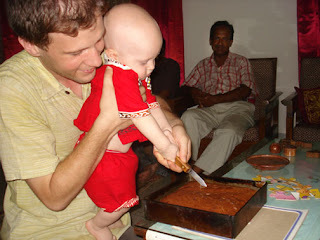 I’ve never thrown a birthday party in Bangladesh before .. so I was all nervous! But I did manage to make enough food, and I think my friends had a good time. We played pin the nose on Elias. (I guess Jacob didn’t want to draw a donkey!) Here is Jacob’s cousin Sanna with the nose. Here is Asif, moving towards the nose-less face! The big boy, cutting the cake. He had a big piece. We all took turns playing some music in all our different styles and languages. My good friend Aru, and her husband and son. Sanna and Markus, with their friends Ola and Sophia, came to see us. It’s always fun to share this place with people who have never seen anything like it. Imagine, they met their first Hindu!! And ate their first jackfruit! Jacob took them to see a friend of his named Shafi, who was working in a remote village. They saw a potter, among other things. From the sound of it, the whole village followed them around! Elias was trying on Uncle Markus’ glasses. Old Dhaka is a part of the city that I have never seen, even though I’ve lived in Bangladesh for about three and a half years now. It’s about three hours away from our guest-house, that is if one goes at a normal time of day! Once Jacob and I tried to take some friends there, but due to political unrest all the streets were cleared and curfew was called early. A few months back, Jacob went down to Old Dhaka to take pictures of the old buildings for a film that his company was working on. He went at around 6:30 am, and by 9 am he was in the office again. Now that’s the way to go to Old Dhaka! We left the house with my sisters at 6:40, and were at the port in less than an hour. The place was still a bit intense — about ten people watched as we peed Elias .. . a little Arabic class of five year olds sang their surahs while their master brandished the stick . . ferries were filling and emptying and hawkers called after us. The problem with going sight-seeing in the early morning is that nothing is open. So we had to just view this palace from the gate. One thing that Old Dhaka is known for is it’s very narrow streets. The alleys off the streets are like tunnels. This is an old Armenian church. The Armenians came here in the 1800’s, and at the peak time there was about 40 families. Now there are about ten families. Despite the early hour, the guards was more than happy to show us around — he even let us go on the roof! While it was neat to see this historical building — it also left me feeling sad. The guard told me that services are held only three times a year. This church is not really a church at all, just an old building that has lasted longer than the people. It took us two days and three nights to get to Ooty from Rajshahi. We traveled three-tier non-AC. Some of my Western friends were aghast, they said that everyone travels AC now. But from the crowds in the non-AC compartments, I could tell that they were quite wrong! We spent the long days playing cards, eating samosas, drinking tea, taking Elias countless times to the bathroom, reading .. . trying to stay clean . . talking in Banglish ..
Elias slept on my bunk. If I carefully maneuvered him to one side, I could stretch out my legs too. Turning over was hard to do and I didn’t get much sleep. But Elias was very comfortable. There were other mothers and their babies in nearby compartments, and when we took Elias for walks down the isles, we swapped stories with them. 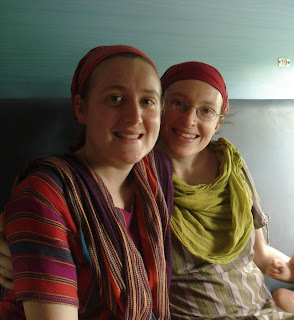 On the trip back, we arrived in Chennai and were waiting at the train station to board our train for Kolkatta, when we heard from the loud speaker that our train had been canceled due to the floods in West Bengal. The lines for new tickets were LONG. Thousands of people just like us, waiting. These are the times that I get to show off my winner of a husband. He ran around, stood in lines, checked the possibility of flying (way expensive), canceled our tickets for a full refund, and finally after a hot morning, got tickets for us seven people for three days later. That was all there was. (And in hindsight, I am glad that we has to wait three days. Those people who got earlier tickets got seats on trains that were so delayed and re-routed that we almost beat them there). It was a Killer hot day. We ended up finding a cheap place to stay at Daughters of the Immaculate Conception St. Thomas International House — perched on top of St. Thomas Mount! But that is another story. Going to brush your teeth at the communal sink took a half and hour! But enough complaining. We were moving towards home. Noelle lovin’ the train . . Towards the end of the trip, we did see signs of the flood. Thousands displaced .. or was it millions? People died too. . and all that happened to us was a little inconvenience. So eight hours later than scheduled, we pulled into Kolkatta. The train had run out of water and we were desperate for showers. After a restful afternoon in Kolkatta, onto another night train to Malda and then cross the border and then home!! That last night on the train we were all delirious pros at this train thing! Jacob, Elias and I joined our friends Chachi and Tuli and made the long train trip down to Ooty, South India, to see Noelle and Chachi’s son Tushar graduate from Hebron School. My parents also came from Thailand, and we shared a flat for a week at Montauban. My little sister Jessa made the decision to get baptized. She was so brave, standing up to give her testimony, and then taking the freezing dip! And yes, it’s Pastor Fernandes baptizing her. Some things in Ooty don’t change! This was the very same place that Jacob took the decisive dip. Pastor Fernandes is planning on retiring in two years time, once the new pastor gets settled in. I’d put a video but our internet is not that fast. Anyways, May 29th was the big day. He took four steps all by himself. He is brash and brave and doesn’t mind falling! Here is someone standing on our gate to pick the mangoes from the tree in our courtyard. Later the land-lady’s grandson ran up with five mangoes, one for each of us. Jacob likes his mangoes really ripe, and I prefer mine slightly sour, and not gooey.